Do you have a conference, company awayday or internal event coming up? Are you looking for an outsider to come in, shake things up, shine a light on the the power of stories at work or glean some tips on how your team can get more fired-up at work? We run workshops and presentations to fire you up, inspire your people and build stronger teams. Here are two of our regular concepts that can be delivered as keynotes, interactive talks or smaller workshops. The Power Of Story: Sharing personal stories humanises an organisation. This session provides your team with the skills to craft and then share their own stories. It helps nurture team spirit, nudge culture change and enable deeper collaboration. Results can be game-changing. Recently Ian’s delivered The Power of Story at Tektronix’s European partner marketing conference in Edinburgh and at Black Sun plc’s employee forum. 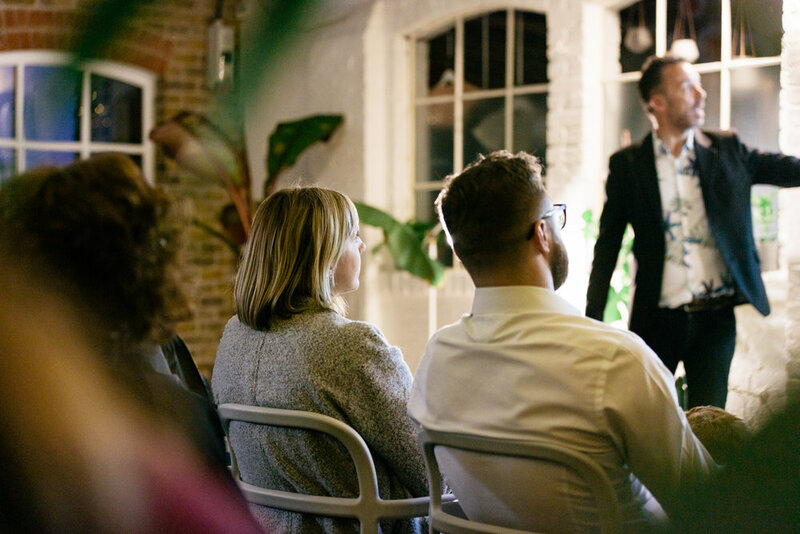 Read what happened at Thomas Cook Money’s workshop when we ran a session around the roaring fire. Fuelling Your Best Work: How can executives rethink their work lives to be more creative, productive and energised at work? This session is designed to reinvigorate attendees’ working practices, to get them thinking differently about how they work and to open their eyes to more creative and innovative ways of working. Recently Ian’s delivered Fuelling Your Best Work at Diageo’s EMEA marketing and innovation awayday and at General Assembly in London. Check out this video to see Ian delivering this presentation. We love the feedback we get from our workshop attendees. One said the workshop had been the highlight of her week. Another said he was overcome with a sense of excitement he hadn’t had since a kid, a feeling he’d never experienced before at work. Ian’s also available to host panel discussions. Contact us for more details hello@iansanders.com. Ian’s speaking experience includes: SXSW in Austin, Texas (2009, 2010); The Do Lectures (2015); Meet The Innovators at The Apple Store London (2013); The Snap Photography Festival (2016); the Marketing Academy's Inspire Live event at Google (2017); Social Media Week London (2017); The BBC (2016-2018); Diageo (2018); Black Sun plc (2018); Thomas Cook Money (2017, 2018); Microsoft (2018); Tektronix (2018); General Assembly (2019); The H Club (2019); The European Court of Auditors (2017); The University of Nottingham's Graduate School (2019); The University of East London (2015, 2016, 2017); the Paris-based accelerator TheFamily (2015); The York, North Yorkshire and East Riding Local Enterprise Partnership (2015); Ravensbourne college (2016); USP College (2015, 2018) and London’s Royal College Of Art (2009); FTIECLA, a joint venture between The Financial Times and IE Business School, delivering executive learning programmes for clients such as Iberdrola (2018).